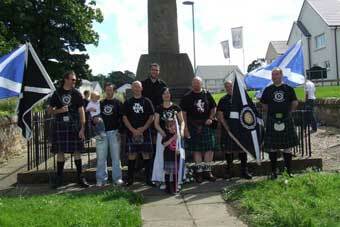 This year’s commemoration was held on a warm sunny Saturday the 2nd of August 2008, the nearest Saturday to the 5th. 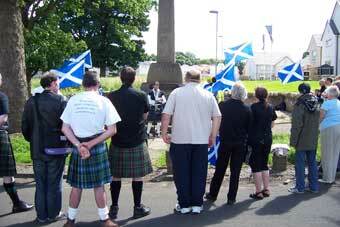 A healthy crowd from various groups gathered around the Robroyston Monument to reflect on the loss of one of Scotland’s favourite sons. 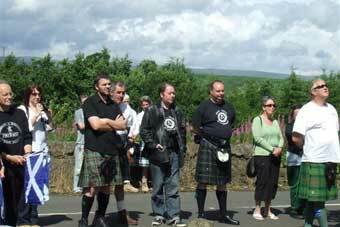 Vice Convener of the Wallace Society Duncan Fenton led this years commemoration with a fine heartfelt appraisal of Wallace’s life, capture and ultimately his execution at the hands of the English and reminded us all of just what a loss to Scotland he was. Next to speak was my good self. As this was my first speech at an event like this I decided to speak from the heart about how I feel about the direction my country’s going and how future generations should always acknowledge the debt we all owe to people like William Wallace. I believe that education is the key, tell us of our history in our schools and then we might actually start to be a nation again!!! The gathered crowd seemed to appreciate my efforts which came as a tremendous relief and I thank everyone for their kind words afterwards. Next to speak was none other than David R. Ross fresh from a whirlwind tour of the USA. some great tales of his time in London, especially the fact that the English thought that we’d finally invaded such were the numbers of patriots who followed him to London en masse!!! David finished with a more personal view of what Wallace has come to mean to him when times aren’t always the way he’d like them to be and how Wallace always seems to be an inspiration to him. David echoed the thoughts of many patriots there that day. 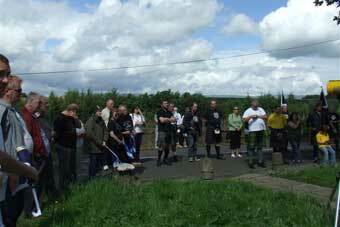 Duncan said a few final words and thanked everyone who was there for the commemoration. 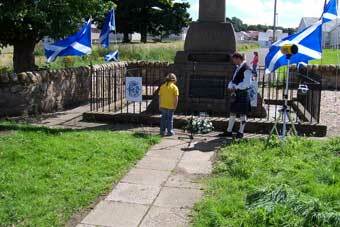 Wreaths were laid by various societies and Scot’s Wha Hae brought proceedings to a close. We then retired to a local hostelry for some, refreshments and some quiet reflection. 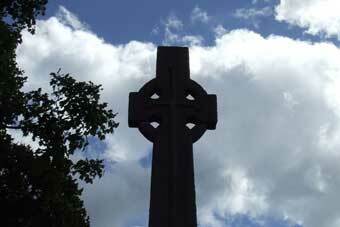 William Wallace may be gone, but he’s certainly not forgotten. Not a bad wee crowd. Young and old were all there. Hopefully you don't see my knees knocking!!! David speaks from the heart. Great turnout for this event this year. 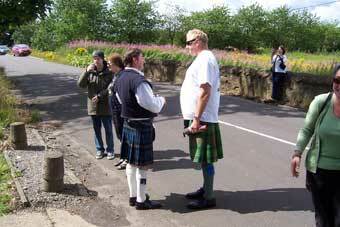 David and Duncan discuss tactics. A young patriot lays a tribute. The laying of the wreath. The boys and girls from Siol. 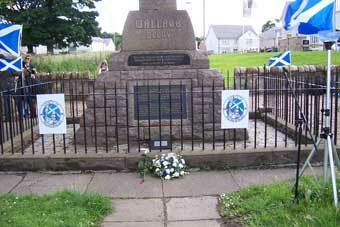 William Wallace, gone but not forgotten. I’d like to begin by thanking the Wallace Society for inviting me to say a few words today and also to thank your good selves for your attendance. William Wallace was taken from us on August the 5th 1305 around midnight from a building in this very field that we’re standing in today. He was then marched to London to take part in a show trial where the guilty verdict was never ever in doubt. Wallace was taken from the court where he met the most gruesome of deaths that anyone here today could possibly imagine. Wallace's execution was reckoned to be the opening attraction of a giant medieval carnival that marked the opening of Bartholomew Fair, the largest medieval market in England at the time on August 24. It would seem that this is what Longshanks considered, entertainment!! I’m sure everyone here will know a lot about Wallace’s exploits so you’ll not need me to educate you about the man. William Wallace in my eyes and millions of others is quite simply a Scottish hero. A man whose story has been told by thousands through the ages such is the high regard that we hold him in. More recently Wallace’s story was told by Hollywood in the blockbuster movie, which was of course Braveheart. A lot of people don’t like what Randall Wallace did with the film, saying that it was historically inaccurate. My biggest gripe (and Ted Christopher’s,) was the fact that at the Battle of Stirling, there wasn’t a bridge or indeed even a river!! But I can forgive the film’s little inaccuracies. Because what it did do was make every man, woman and child in Scotland aware of who William Wallace was and pushed Wallace’s name into our very psyche. If you talk to children today, most of them know about Wallace which is probably as a direct result of having seen the film at some time. Braveheart was more than just a film though. It got folk in Scotland talking about Wallace and perhaps encouraged them to go and learn more about the man as I and many others have done. Unfortunately the same can’t be said of Scottish History in general. Ask the same kids if they’ve heard of Robert the Bruce or Bonnie Prince Charlie and the response isn’t always as positive. Ask them who won this years Big Brother though, and you’ll probably get an answer right away!! But it’s not the children’s fault, it’s not even the parent’s fault, it’s been the fault of our education system. 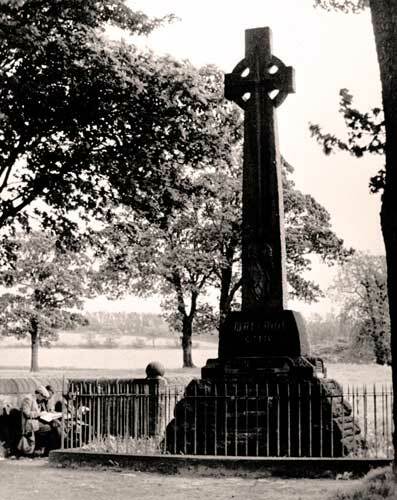 Through the years, successive Scottish governments have ignored Scotland’s history and we should all be asking why. They tried to deny us our history by ignoring it in the schools. You had no chance of seeing anything on the telly relating to our history or culture unless you wanted to sit up to the wee small hours. But it didn’t work, you folk here today are testament to that. We now, at last, seem to have a government in charge that have finally put Scottish history into the curriculum which will hopefully give the next generation a better understanding of their country’s rich and varied past. I myself wasn’t so lucky, I went to school not far from here and through Primary through to Secondary school I don’t recall any of my own country’s history being taught to me. We had stuff like the Russian Revolution, The First World War and a lot of British History which meant of course, a lot of English history. I’ve never been great with dates but I still know when the battle of Hastings was!!! Don’t get me wrong, I have no objection to learning about these events, but not at the exclusion of my own country’s history. There was a guy at my school called George Best and everybody wanted to be his pal, how cool would it have been to have had a mate called George Best. Closer to home, living on my street there was a guy called William Wallace. He had a very strict Mother who insisted that we call her son William. It’s no Wullie, his name’s William!!! She used to shout at us. The irony isn’t lost on me, how much cooler would it have been to have had a pal called William Wallace!! Again, we didn’t know any better. Recently, the Wallace Society was asked if we’d like to attend the local Wallace Well Primary School’s open day. We were asked if a few of us could get dressed up and talk about Wallace and his life. Together with Siol Nan Gaidheal we set about arranging a wee stall with posters, wooden swords, books, flags etc for the kids. We ran out of posters pretty quickly, in fact we ran out of everything!! The children were very knowledgeable of Wallace and that really impressed me. We spoke to several parents and teachers who told us of various projects the children had been doing at school regarding Scotland’s history, and the overriding feeling was that the kids were so into it. They were actually enjoying history lessons. We also had with us, various weapons from Wallace’s time and boy did the kids love them. Their wee eyes lit up as history unfolded before them and they got to hold and feel these ancient weapons of war. The smiles on their wee faces were a sight to behold, if not just a wee bit scary!! So things are definitely changing for the better in our schools at least which is fantastic news. I have a friend, Jock Ferguson, who’s an actor, and I’m lucky enough to be involved in some of his projects. Most of them are historical and a lot of them are aimed at children. Recently we were up at Fyvie castle near Aberdeen for a corporate gig for an oil company, who fancied the idea of having Robert the Bruce and his entourage walking about the place. 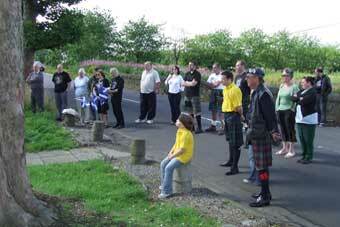 The whole gang was there, The Bruce, his Queen, Lady Isabella and a few assorted Hairy Highlanders. Our job was basically to mix with the crowd, have photos taken and generally entertain the kids. We showed them some sword fighting moves and then gave it laldy with plastic swords and axes; I never stood a chance. I don’t know what I was I thinking, offering to fight them all at once, some of them were dirty wee fighters as well, and were definitely putting the boot in. Kids just seem to like beating me up at these things but it’s all great fun which is the whole point. Later on when they’d all calmed down a bit, we told them some stories of Wallace and The Bruce and they fair lapped it up, along with quite a few adults as well let me tell you. Big Jock knighted most of the children there that day and they all went away with a big smile on their faces holding their wee certificate to proudly show off to their Mum’s and Dad’s. In fact a few of the Mum’s and Dad’s got knighted as well. As always seems to be the case at these events.My own certificate is on the fridge by the way!! We finished off the event by handing out the little Ladybird books of Wallace and The Bruce and as we were finishing up we noticed a wee queue of them waiting in a line behind us. We soon realised that they wanted us all to sign their books for them. They’ll never know just how much that made my weekend! !So things are getting better……but. You just knew there was going to be a but didn’t you!!! It doesn’t matter to me what your politics are, it shouldn’t prevent you from loving your country. Despite people like this it is getting better. At least in the Schools the children are learning where they came from and what it means to be Scottish. It would seem that Scotland has recently woken up and discovered her identity again. She’s always been a very proud nation and she’s beginning to realise that she can once again stand on her own.Scotland’s history is very important to our identity as a people, take our kilts, our music, our language our heritage away and you lose the very thing that makes us Scottish.I for one refuse to let that happen, and seeing so many of you here today makes me realise that I’m not alone in wanting to preserve Scotland for our future generations. 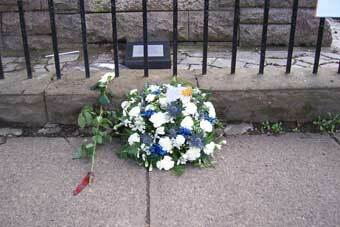 We’ve gathered here today in commemoration of one of Scotland’s favourite sons. 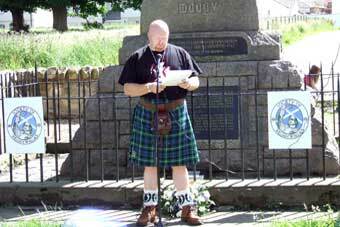 William Wallace was very much a part of our past. 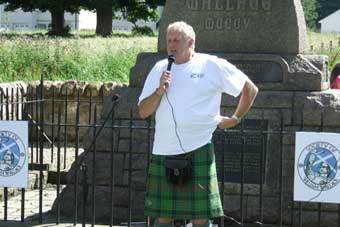 I know William Wallace will be very much a part of our future…..